easyJet has a neat little feature on the route map they show on their website: you can set criteria such as maximum flight time and minimum temperature for the month you plan to fly from any airport, and they show you match flights. We have had a couple of questions earlier on searching by date or "broad" search for flights. 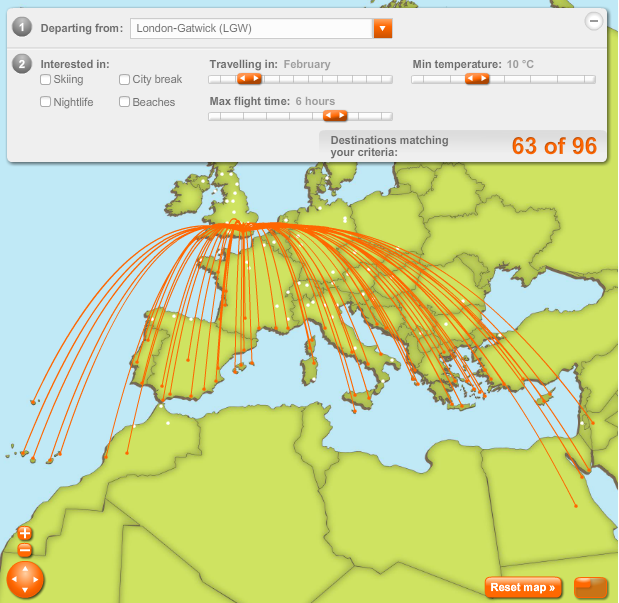 Is there any online booking / search site at all similar to easyJet's site that allows search for flights using other criteria such as weather, flight times, et al? British Airways seems to have a similar feature called TripSeeker. You seem to get even more parameters to fiddle with! Not the answer you're looking for? Browse other questions tagged air-travel online-resources weather-and-climate or ask your own question.